On Monday, Dec. 24, Prime Minister Binyamin Netanyahu took a big gamble by leading a unanimous coalition decision to call an early election on April 9. He could be crushed under the weight of multiple corruption probes, or he could sail through to his fourth term as head of government, breaking all records as Israel’s longest running prime minister with the highest number of wins at the polls. Opposition leaders were clearly bucked up by the coming contest. Zionist Union leader Avi Gabay said: “It’s a straight contest between Netanyahu and me.” Political commentators gave high ratings to Yair Lapid, as well as Education Minister Naftali Bennet, who failed to persuade Netanyahu to name him defense minister after Avigdor Lieberman quit, and the promising newcomer, former chief for of staff Benny Gantz. However, the average Israel voter has most often been swayed by considerations of security when choosing his/her leaders. 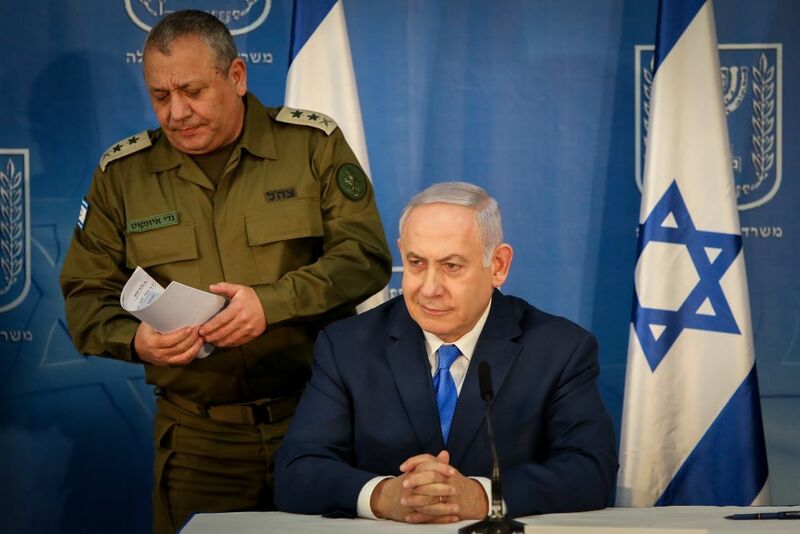 In recent security crises, Netanyahu has increasingly turned out to be of one mind with IDF Chief of Staff Lt. Gen. Gady Eisenkot for driving a succession of crises away from major war confrontations into alternative channels. In this, he bucked his own hawkish Likud and the communities of Judea and Samaria. The Netanyahu-Eisenkot duo pair refrained from blocking these territories’ highways to Palestinian traffic, even after deadly drive-by shootings. They waved the Qatari dollars, derided as “protection,” through to the Hamas terrorist rulers of the Gaza Strip, instead of a routing them as demanded by Lieberman. And finally, Netanyahu as defense minister backed the chief of staff’s decision to go for Hizballah’s cross-border tunnels instead of its arsenal, knowing that Hizballah would weather the challenge unharmed and unbowed. Both are criticized loud and often for using kid gloves against terrorists at the expense of the IDF’s deterrence and the country’s future safety. Nonetheless, Netanyahu broke with his natural political allies to stand foursquare behind the chief of staff. His secret? He had discovered in private opinion polls that 58 percent of the voting public were behind his policy of restraint. Eisenkot retires next month. With campaigning in high gear, few will notice that his successor Maj. Gen. Aviv Kochavi will most likely continue his temperate tactics, especially under a re-elected Netanyahu, for as long as a full military confrontation can be avoided. The Netanyahu-Eisenkot partnership has in some senses allowed a new political bloc to take shape, which better suits broad strata of the middle and upper classes than the existing polarizing party setup. Maybe this explains why the prime minister consistently tops all opinion polls as the favorite to succeed himself, notwithstanding more than two years of police investigations played up day by day by the media. The reporting on an early election was also admixed with claims that the prosecution was close to indictments. Even so, the squeaky clean Benny Gantz, while his debut on the political scene is rated high, falls short of a direct challenge to the ubiquitous Bibi. A large segment of the voting public appears more inclined to leave the country in the hands of a cautious prime minister, even if he is proved to be corrupt, and a less flamboyant army chief, who are intent on keeping the country clear of the loss of life and destruction inherent in major wars for as long as possible, while conducting controlled, covert operations against enemies. Therefore, Netanyahu felt able to launch his campaign with his usual confidence, especially after learning that the attorney general, Avichai Mandelblit. had chosen to hold back on an indictment decision so as not to influence the election one way or another. Barring sudden national or security catastrophes, Netanyahu’s chances of staying in the prime minister’s residence are fairly good. This entry was posted on December 25, 2018 at 3:45 PM and is filed under Uncategorized. You can subscribe via RSS 2.0 feed to this post's comments. You can skip to the end and leave a response. Pinging is currently not allowed.